I did extensive research before planning our trip and looked at multiple tours. 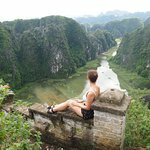 We went with Zonitrip's 7 day adventure tour (to Ba Be Lake, Cao Bang/Ban Gioc and Ha Giang) as it included multiple activities that aren't organised by most other tours. This included Kayaking in Ba Be Lake or near Ban Gioc waterfall or cycling to Hua Ma Cave. There were multiple treks that our guide (Zoey) who took us to village after village that seemed completely off the beaten track. We walked off small tiny pathways will no signs that led further and further into small villages. Often we would be walking in rice paddies and taking various shortcuts. 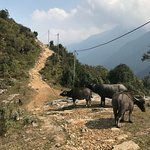 One great unexpected experience was taking a local villagers suggestion and walking up the top of a small mountain in Phia Thap with magnificent views. it was also Zoeys first time and was well worth the 1hr trek (up & down). Zonitrip seem to be very knowledgable on where are good places to stay and take in reviews and feedback from many others. Every place we stayed out, we were very happy and preferred the booked accommodation over others in the same village. Communication with Zonitrip was excellent before the trip had begun and we came to an agreement on which accommodation was suitable for each night and any preferences. I also told Nghia my plans to propose to my partner with certain specific requests (including organising a...I did extensive research before planning our trip and looked at multiple tours. 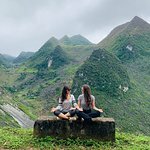 We went with Zonitrip's 7 day adventure tour (to Ba Be Lake, Cao Bang/Ban Gioc and Ha Giang) as it included multiple activities that aren't organised by most other tours. This included Kayaking in Ba Be Lake or near Ban Gioc waterfall or cycling to Hua Ma Cave. There were multiple treks that our guide (Zoey) who took us to village after village that seemed completely off the beaten track. We walked off small tiny pathways will no signs that led further and further into small villages. Often we would be walking in rice paddies and taking various shortcuts. One great unexpected experience was taking a local villagers suggestion and walking up the top of a small mountain in Phia Thap with magnificent views. it was also Zoeys first time and was well worth the 1hr trek (up & down). Zonitrip seem to be very knowledgable on where are good places to stay and take in reviews and feedback from many others. Every place we stayed out, we were very happy and preferred the booked accommodation over others in the same village. Communication with Zonitrip was excellent before the trip had begun and we came to an agreement on which accommodation was suitable for each night and any preferences. I also told Nghia my plans to propose to my partner with certain specific requests (including organising a bottle of champagne, booking a nice hotel with nice views/roof top in Cao Bang, ensuring private raft/boat in Ban Gioc waterfall etc). This was of course all done (and my partner said 'yes'!). The best part of the trip was have our Driver (Chu Mi-Anh?) and our guide Zoey. The driver was excellent with 30 years of driving - we felt very safe on the hazardous roads in Ha Giang. As my partner was scared of biking in Ha Giang, we took a private car and she felt incredible safe (unusual for her) and slept on each trip! I'm glad when received your good feedback, our team is very happy when you were pleased with my service. Your review is very helpful for other travelers will find many experiences via your experience in Vietnam with us. Your satisfaction is our success and gives us a big motivation in our work. I hope that we will have more chance to serve you and your friends in the future. Once again, thank you very much and best regards. I chose Zonitrip based on reviews. True enough those reviews didn’t lie. We, seven of us were met at airport, transferred and checked in to Hanoi hotel, had a day city tour, sent to train station bound for Lao Cai, met at Lao Cai and transferred to Sapa. Checked in to Sapa hotel, went for trekking Fansipan, had a day of motorbike tour to Hmong & other hill tribes villages around Sapa, sent back to train Lao Cai station, met by rep very early in the morning, had local street breakfast, checked in to hotel, fetch to airport for departure. In our 5D4N trip we met various staff and representatives at each point of the itinerary but I have yet to meet Nghia. We contact only via email and Messenger. I hope to meet her sometime in the future. The execution of the itineraries was impeccable. I would strongly recommend her to the world. One of the most remarkable tours I`ve been on. I`m from Norway, and have for a while been playing with the thought of doing a “motorbike tour in Vietnam”, a country which has fascinated me since I was a child. By searching Google I found the company “Zonitrip” offering different options for such tours. I chose the “9 day motorbike tour in North Vietnam” and was picked up at my hotel in Hanoi by Nghia, the owner of Zonitrip. On each our bike we started the tour from there. Nghia is a nice, service minded, flexible and easy going person, and even from the start, I felt I had known her for my whole life(it was like travelling together with an old friend). A lot of beautiful nature, lake, rivers, rice fields and terraces, mountains, villages, cultures, towns, people, food and fun. Driving on mountain roads and trails, from town to town, village to village and areas with different groups and tribes. 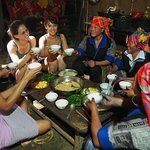 Experiencing the villages and its people, how they live, how they produce their food, and also a lot of information and legends about the groups and places(from Nghia). Thank you Nghia, I`ll never forget this tour. It's so happy when received your good feedback, it made me remember your trip with you so much. Your trip with you was also one of my funniest, most dangerous but most interesting I've been on. You like my dad, my old friends, I also learned a lot from you. I hope to see you again someday. Wishing you have the health to do more special and crazy things more. We booked a 3-day hike in Mu Cang Chai with Zonitrip and it was absolutely amazing. We were there around Tet holiday and really experienced the celebrations together with the people living in the rice terraces. I would highly recommend booking a trip to Mu Cang Chai with zonitrip. Your satisfaction is our success and gives us a big motivation in our work. All people from Homestay service, the food. I do hope that we will have more chance to serve you and your friends in the future. We just returned from an amazing 5 days tour in Northern Vietnam under the guidance of Nghia from Zonitrip. Nghia was very professional and knowledgeable and made our trip interesting, experiential and joyful. One of the most memorable trips I’ve ever taken!! My friends and I took a 10 day trip with Zonitrip and it was truly unforgettable and different to anything we have experienced before. Nghia and our lovely and experienced driver, Anh, took care of every detail and tailored an unforgettable custom trip for us. We visited a wide variety of places in Northern Vietnam having the opportunity to hike, bike, and kayak staying in home stays along the way. 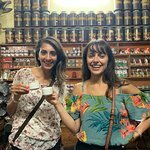 We saw beautiful landscapes, learned about Vietnam’s history and culture, were welcomed into people’s homes, and learned quite a few words in Vietnamese! Having a local guide allowed us to have an authentic experience that would’ve been inaccessible to us otherwise. We all felt safe and supported to share personal and honoured to be let in to learn about the hardships of life in Vietnam, as well as the joy and optimism of the Vietnamese people. Nghia wasn’t just our guide - by the end she was our friend and like a sister and we hope to see more of Vietnam with Zoni Tours and also to meet Nghia in another country as a friend in the future. She and her team have wonderful upbeat energy and she deeply care about their guests. We are SO happy that we chose Zoni tours from the vendors that we looked at - it was a unique and beautiful experience and couldn’t have felt more cared for. We very highly recommend seeing this magical country with Zoni trip!! I'm very happy when received your good feedback. I and Mr Anh also missed you, Robin, Inna so much. We had great times together, like friends and sisters. Our team is very happy when you were pleased with my service. Your review is very helpful for other travelers will find many experiences via your experience in Vietnam with us.